On most of the days our breakfast at home would be idli or dosa true to our South Indian genes. Though we have tried other options like cereal, fruit, toast or oats, nothing comes close to the filling breakfast like idli or Dosa for me. Usually I make a full dabba of batter during the weekend that lasts for two weeks – super convenient during busy mornings. 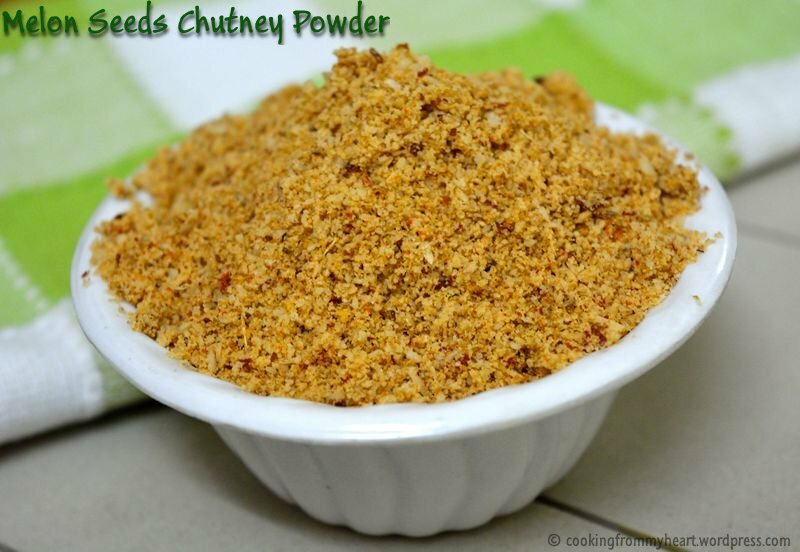 To go with our quick breakfast option, I make some kind of idli podi or chutney powder. 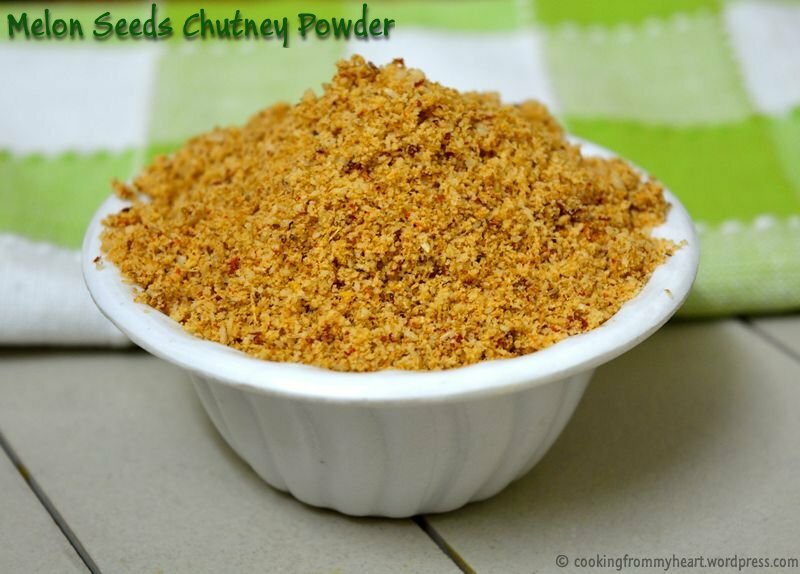 Few days back, I posted Flaxseed Chutney Powder. When that batch of it was over, the husband was checking with me every day as to when I plan on making the next batch. When I discussed about this with Amma, she gave me an idea of making idli podi with Melon Seeds. It sounded super interesting, for I have never tried or tasted it. Immediately, the search for Melon Seeds happened and as soon as I was home with a pack of Melon Seeds, I started preparing the podi. 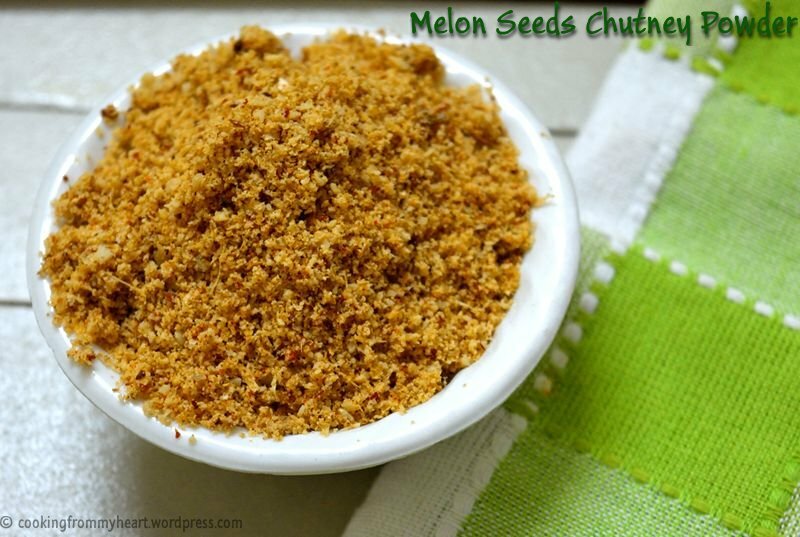 The chutney powder turned out a beautiful golden color, with melon seeds being white. I kept the other spices to a minimum to bring out the flavor of melon seeds. 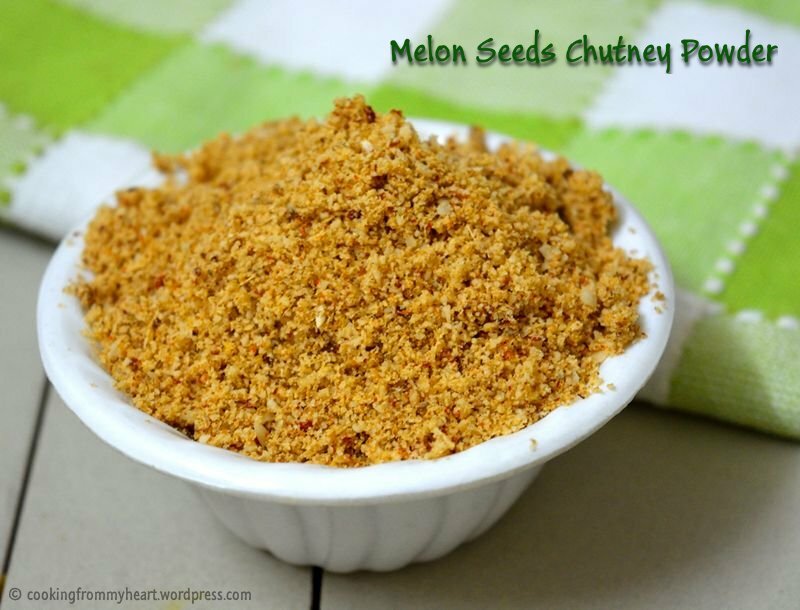 Since melon seeds are used in the making of this podi/chutney powder, it requires no additional oil while serving. In fact, I just dip a piece of my hot-hot idli dosa into this chutney powder and it tastes super awesome – the powder is rich by itself. In a thick bottomed pan or kadai, dry roast jeera on medium flame until golden brown. Set aside. Repeat the dry roasting with coriander seeds. Set it aside too. Continue the dry roasting with dried red chillies. Let all these ingredients cool down. In the same pan, dry roast the melon seeds on low flame. The seeds would start puffing and popping. On the melon seeds slightly browning, remove from heat and let it cool. In the same pan, dry roast garlic pods along with the skin for 3-4 mins. Once all these ingredients are cooled down, blend them all into a coarse/fine powder after adding the required salt. Serve as it is or topped with oil along with idli/dosa/rice/roti. The spiciness of the powder can be as per personal preference. Increase or decrease the number of dried red chillies. After grinding the powder, spread it on a newspaper to let it cool down completely before storing it in an air tight container. I have not added curry leaves as I wanted the flavour of melon seeds to dominate. I ground this chutney powder neither too fine nor too coarse, this again is a personal preference. Melon Seeds have natural oil/fat content, so the powder can be served as it is. Hi! Are the melon seeds used unsalted ones or salted ones?